When a new unknown contact sends you a message, WhatsApp already asks you if this is a spam message: if so, WhatsApp asks you to press the Report button, so that contact will be blocked by WhatsApp if they will receive a lot of reports. It is also possible to find a Report spam button in the Contact Info section, that will allow you to report a saved contact/business. In according to our friends Whatsappen, a spokesperson told them that the company is watching spam closely. In fact WhatsApp has decided to do more to fight against spam, introducing a new interesting feature. A spammer never sends spam messages to a single contact, but he is used to send them to multiple users, selecting them in his contacts list, picking these data from the Internet or from some registration services. These messages may content unwanted advertising and fake news, and they often invite you to forward the message to your contacts. 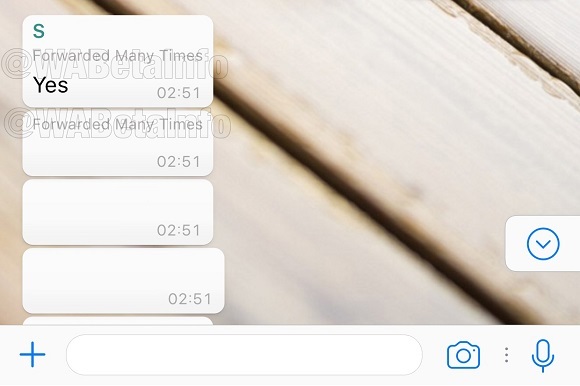 So, he is used to forward one or multiple spam messages to multiple contacts using the Forward option in WhatsApp: for this reason WhatsApp is going to do something about messages that have been forwarded many times. When a message is forwarded a lot of times, WhatsApp informs the user about this. Note that this isn’t officially enabled yet and WhatsApp is developing right now the feature. This will be implemented in Android too in the next updates. Actually, it’s possible to select 30 messages at once to forward at the most. Futhermore, the user will be able to correctly forward without alerts a single message 25 times at the most, otherwise this alert will appear in the forward picker. Spammers cannot use Broadcast Lists because recipients won’t receive their messages, seen that they have not their numbers saved in the Contacts List. When a message is forwarded a lot of times, you can notice a label on the bubble. At moment, this appears only on received messages. 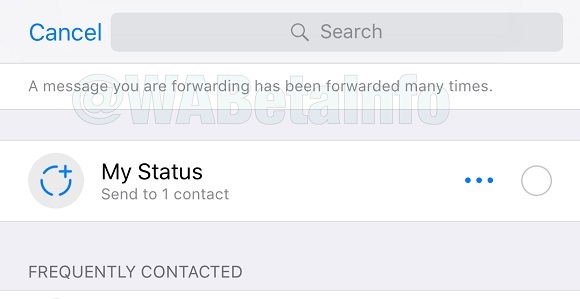 At present WhatsApp does not block the forwarding of a message forwarded more than 25 times. It is not yet clear how they will manage this feature because it is still under development and WhatsApp is deciding how to implement it and/or its functionality. Obviously, the spammer may start to forward a new message to bypass this, but this operation will certanly slow down and it will discourage him. We recommend to always report the contact when you receive spam messages. WhatsApp is already using some tools to autodetect spam, but reporting spam is the most efficient action. When we will have more information about this feature, we will immediately inform you, notifying on Twitter and our Telegram channel. Previous PostPrevious WhatsApp beta for Android 2.18.12: what’s new? Next PostNext WhatsApp is rolling out the YouTube support to directly view videos in the app!